It’s official. I’m no longer cool. Admittedly, my coolness peaked a long time ago (we are talking the late 80s to early 90s) and it is true that my coolness may have been just in my head. That hasn’t kept me from clinging to the illusion of coolness for decades, however. The latest example of my extreme distance for all that is hip and happening (see I don’t even know what term to use) recently came in an unexpected area. The Dewey 780s range to be exact. This year I’ve been ordering the musician and band biographies. As the year has progressed, I’ve been excited to be able to order books about bands, artists, and musical movements that I’ve always thought of as cool. Sadly as these books have come in, I’ve begun to realize that many are retrospectives with an emphasis on how great the band/artist/movement used to be and their importance to music history. Clearly I can no longer think I’m hip because I like New Order. Even so, all of these books are a lot of fun and well worth your reading time, no matter what your position on the coolness spectrum. Even if you aren’t from the Midwest and grew up in a big town, John Mellencamp’s music and career is worth looking into. Sure he had that whole weird name change thing as he was starting out, but that was the music company’s fault, man. This biography sets out to reassess and appreciate a musical talent that is often overlooked. This collection of over a hundred photographs of the band, from their formation in 1980 to their initial breakup in 1993, is a fun and admittedly nostalgic trip. Come for the cool haircuts and skinny ties, stay for the really great music. A film, an album, and a cultural phenomenon, Purple Rain continues to cast a long shadow on the cultural landscape. This book will tell you how the diminutive legend from Minneapolis got his unique sound and vision to the masses. A collection of recent interviews with member of the more influential New Wave bands including The Smiths, Tears for Fears, Adam Ant, Echo and the Bunnymen, Devo, New Order, The Thompson Twins, INXS and many more. Sounds like a great retro MTV music video mix list as well. I’ll admit I tended to look down at ‘hair bands’ back in the day. But does that mean I can’t hum along with several Motley Crue, Ratt, Bon Jovi and even Poison songs? Absolutely not. This well researched and entertaining look at a colorful and well moussed musical phenomenon just might increase my appreciation. I lot of factors make Billy Idol who he is: The snarl, the fist pump, the spiky blond hair, the amazing fact that he is still alive. This autobiography tells of his life’s highs and lows with a characteristically unapologetic and in your face attitude. Would you expect anything else? Would you?! 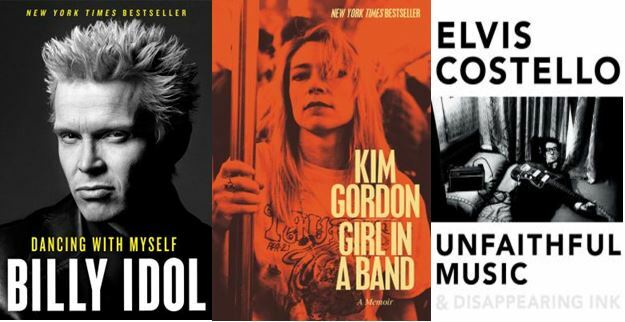 This memoir from Kim Gordon, a founding member of Sonic Youth, is more than a simple history of the band she was a part of for so many years. Instead it is a memoir of her upbringing in Southern California, the gritty 1980s New York music scene, her marriage, motherhood and everything in between. A good read even if you aren’t into their music. Though, why wouldn’t you be? You will have to wait until the fall to get your hands on this memoir from Mr. Costello but it is sure to be worth the wait. Always unconventional and ever-changing, it should be a kick to get his thoughts on all the great music he has created over the years. To prepare for the book’s release and to better appreciate the man and his music, check out fellow blogger Ron’s appropriately titled post The One and Only Elvis. While my musical tastes are clearly no longer cool, there is one silver lining. As all these great books point out, the music created in my heyday has clearly influenced the new music coming out today. Luckily I can follow Lisa’s excellent new music blog posts to find out which new bands might appeal to me. Viet Cong, the band not the political movement, rocks! Now if they would only put on some skinny ties and a little eyeliner.